From I10 take Grand Parkway (99) South go to Fry Rd exit and turn (R) go to Grand Trace Lane turn (R) go to Shadow Cliff turn (R) go to Trailstone Ln turn (R) go to Alder Springs Lane turn (L) go to Rivermoss turn (L) home on the Left. Hello, I’m interested in 3906 Rivermoss Lane and would like to take a look around. 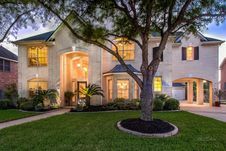 The details on 3906 Rivermoss Lane: This house located in Grand Lakes, Houston, TX 77494 is currently for sale for $535,000. 3906 Rivermoss Lane is a 4,021 square foot house with 4 beds and 3.5 baths that has been on Estately for 3 days. 3906 Rivermoss Lane is in the Grand Lakes neighborhood of Houston and has a WalkScore® of 25, making it car-dependent. This house is in the attendance area of Griffin Elementary School, Beckendorff Junior High School, and Seven Lakes High School. Listing Courtesy of: HAR and Keller Williams Premier Realty. © 2019 Houston Realtors Information Service, Inc. All information provided is deemed reliable but is not guaranteed and should be independently verified. Houston Realtors Information Service, Inc., Estately and their affiliates provide the MLS and all content therein “AS IS” and without any warranty, express or implied. The information included in this listing is provided exclusively for consumers’ personal, non-commercial use and may not be used for any purpose other than to identify prospective properties consumers may be interested in purchasing. The information on each listing is furnished by the owner and deemed reliable to the best of his/her knowledge, but should be verified by the purchaser. Houston Realtors Information Service, Inc. and Estately assume no responsibility for typographical errors, misprints or misinformation. This property listing is offered without respect to any protected classes in accordance with the law.